Lance Corporal David Motari, the Marine videotaped throwing a puppy into a rocky ravine, is being “separated” from the Marines and others involved in the incident are being disciplined. I suppose it’s at least some kind of justice. But, this isn’t the only video of servicemen abusing animals and clearly more needs to be done. The Humane Society of the US has identified three areas where the Department of Defense needs to improve or change its policy concerning animals. 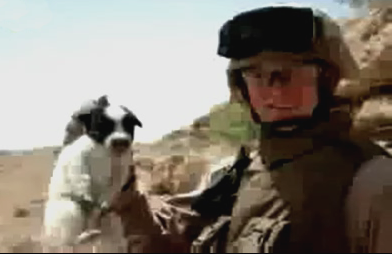 American Servicemen are prohibited from adopting stray animals they befriend in Iraq. Pet and stray dogs are being killed in an attempt to prevent rabies although research finds that these culls are both ineffective and inhumane. There is no prohibition or punishment for cruelty towards animals in the Uniform Code of Military Justice. You can help by contacting the Dept. of Defense and the various branches of the military and urging them to make a change. It’s about time justice was served. This boy made the Marines look bad and they are brave soldiers.